We have been captivated by these fabulous Airplants when we first saw them hung at nursery gardens along Jalan Sungai Buloh several years ago. However, these nurseries, being too far away, about 40 km away from our home, somehow deterred us from acquiring any. Fast forward to last year, sometime in June, we chanced upon a bunch of Tillandsia at a nursery in the vicinity of our neighbourhood. It rekindled our love and desire to possess it. Even though it costs RM35, quite pricey for that smaller than fist-sized cluster, we joyfully brought it home to add to our garden collection. Moreover, the nursery helper informed us that it needed no garden space or soil at all. That’s great info as our small garden has space constraint! 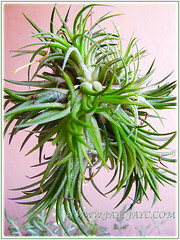 Aptly known as Air Plant, it’ll be happy and does just fine if provided something to hang or sit on. Amazingly, with our tender-loving-care, our exotic plant started to show signs of blooming six months later as seen in the images on the left. We did not expect flowering so soon. What a happy and delightful surprise! 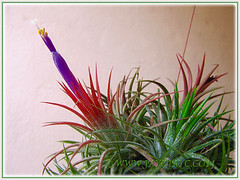 Googling for its ID, we found that the genus, Tillandsia has about 730 species. 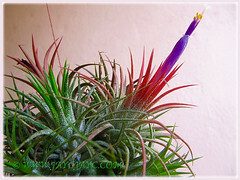 Whatever, we are glad to know that our plant’s species name is T. ionantha. We’ll settle for this name and not muddle our brain over names of the many cultivars and varieties that this species has. 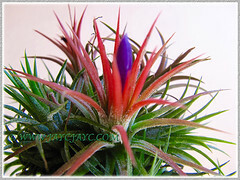 Botanical Name: Tillandsia ionantha Planch. (basionym: Tillandsia erubescens, Pityrophyllum erubescens). 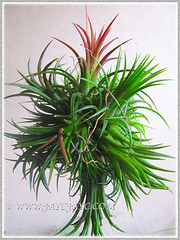 Common Name: Tilly, Air Plant, Airplant, Blushing Bride, Sky Plant. Etymology: The genus name, Tillandsia was named after the Swedish physician and botanist Dr. Elias Tillandz (1640-1693) by Carl Linnaeus. 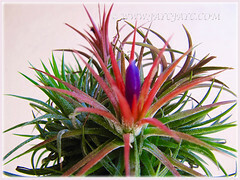 The species epithet, ionantha is derived from the Greek words, ion, meaning violet and anthos, meaning flower. Origin: It is native from Mexico to Central America (Costa Rica, El Salvador, Guatemala, Honduras and Nicaragua). It is naturalised in Broward County, in southern Florida. 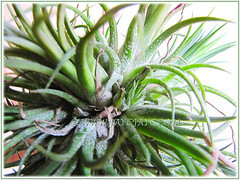 Features: Tillandsia ionantha is a very popular species of the genus, Tillandsia that consists of about 730 species of evergreen, perennial flowering plants. It is an epiphyte of tropical rainforests that absorbs water and nutrients from the air through its leaves via trichomes, the silvery-grey small scales on their leaves. In the wild, it grows on trees, anchoring itself on the tree branches with their small root system. This hardy and gorgeous Tillandsia ionantha is among one of the most popular species sought after by gardeners, collectors and hybridisers as it is small, compact, attractive and easy to cultivate. It is an evergreen and herbaceous plant with green leaves up to 6 cm long and are covered with silvery-grey scales. The basal leaves are stout and taper gradually to a tip upwards and bend outwards, forming a lovely rosette. As the plant grows and matures, it will produce offsets or pups prolifically and if left as is, it will eventually develop into an attractive dense clump of rosettes that will reward you with blooms in due time. Also, you can remove the pup once it reaches half the size of the mother plant and propagate as a new plant. This exotic and unique airplane will undergo a dramatic change in colour as it prepares to bloom. It is truly remarkable to be able to observe the whole flowering process. The inner green leaves will change to a deep orange to red colour when it starts to bloom, presenting a wonderful contrast amongst the foliage. Gradually, a torpedo-like inflorescence in vibrant purple will protrude from the centre, increasing in length to over 4 cm, with violet petals, yellow stamens and whitish pistil emerging from the end. Once the blooming period is over, the leaves return to green in colour again. 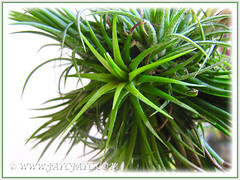 Tillandsia ionantha has numerous cultivars, varieties and hybrids. 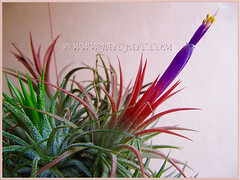 Culture (Care): Tillandsia ionantha or Blushing Bride as commonly named is an easy and fun-growing plant. It needs minimum care with emphasis on light, water and air circulation. Light: Grow in bright light or filtered sunlight. Avoid full or direct sun that will scorch its leaves. Moisture: Spray plants or soak them in water for 20 mins, preferably with rain water or tap water that has been left standing several hours or overnight to remove chlorine, etc. that could harm your plant. Then gently shake of excess water or turn them upside down to drain off excess water. The base of the rosette should never be left in standing water that will cause it to rot and die. It loves a warm and humid environment. Watering should be done in the morning, either daily in a hot and dry environment or on alternate days in a cool and humid climate. 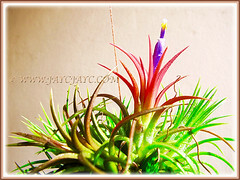 Others: Good air circulation is essential for Air Plant’s healthy growth. Brown leaf tips are signs of dry air, so spray mist them regularly to increase humidity. Trim any brown or dead leaves off your plant with scissors to keep it aesthetically pleasing. Roots can be removed if you wish or leave as is if you need to anchor the plant for mounting purposes. Though fertilizing is not really needed, it does benefit from being fed once monthly and lightly with a bromeliad fertilizer or liquid fertilizer for foliage plants. Free from garden pests. It is frost tender and requires temperatures between 10°C to 30°C. Since it’s not frost tolerant, it is advisable to grow indoors as a houseplant or in a green house. Do provide sufficient bright light or filtered sun, air circulation and adequate moisture to maintain a healthy plant. For example, it can be located at the kitchen window or bathroom where they can get adequate bright light or indirect sunlight. Use a humidifier to increase humidity if needed. Propagation: Can be propagated from seed but growth is slow and take years to mature.. A preferred and popular way is by detaching the pups or offsets when they reach half the size of the parent plant and grow them individually as new plants. 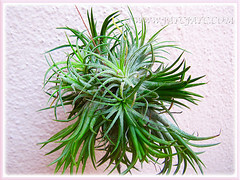 Usage: Tillandsia ionantha or Sky Plant will be excellent ornamental specimen as a houseplant or grown outdoors. An indoor or outdoor knockout decor plant when placed in hanging glass globe-like terrariums, decorative glass jars, seashells, vases or mounted on crevices of wood/driftwood as centrepiece. In fact, the possibilities of displaying them creatively and stylishly in your home and office are endless and limited only by our own imagination. Anyway, since it tends to grow into dense clusters of plants, it will look very nice just hanging, needing no mounting at all. 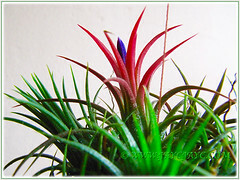 These durable air plants can be used decoratively in floral arrangements. Also, it’s ideal to be grown on tree branches as added colour and interest to your garden.